Anxiety is pretty common. For some, it is triggered when life-changing events happen (such as getting a new job). Others deal with it daily, often struggling with fear, dread or a sense of worry for most of their waking hours. This constant state of uneasiness becomes exhausting, leading those who are affected to seek immediate solutions. Let me introduce you to Epsom Salt. It differs from table salt in that it is made up of magnesium and sulphate as opposed to solely being sodium chloride. This has a number of benefits, most notable at first is that it doesn’t dry out your skin. It leaves your skin soft, which makes it a very comfortable substance to add to your bath. The effect of Epsom Salt goes beyond soft skin – it is also a favorite of many to help reduce their anxiety. The Magnesium contained in the crystals help to relieve anxiety. When we feel anxious, our body depletes our Magnesium levels to compensate. Magnesium helps your body produce Serotonin, which helps your body feel well and happy. Without Magnesium, your body can’t produce as much Serotonin, leading to a prolonged increase in feelings of anxiety and stress. Epsom Salt is absorbed through the skin, so adding some to your bath is a great way to increase the amount of magnesium in your body and get your Serotonin levels back to normal. The University of Birmingham did a research study on this phenomenon and found that people who took Epsom Salt baths saw their magnesium levels increase without any side-effects. There are plenty of Epsom Salt products on the market, almost all of them provide similar benefits. Here are a few of the top ones. 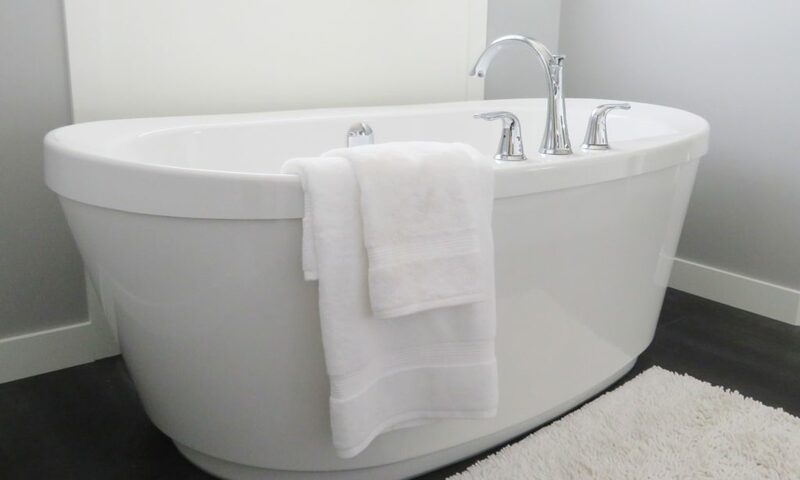 For a standard-sized bathtub, fill up your tub with warm water at about the same amount you would when taking a normal bath. While the tub is filling up, add two cups of salt so it naturally mixes in while the water is running. Once your tub is filled all the way, you will be ready to take your bath! If you want to spice up the bath a bit more, we would recommend adding two cups of baking soda and half-a-dozen drops of lavender oil.